The farmhouse is located on the edges of the Nadwarciański Landscape Park (an area rich in swamp-dwelling and migrating bird species) and of the Pyzdry Forest (the land of “iron homes”). 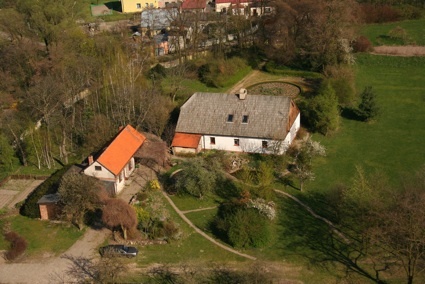 The farm has existed since Medieval times and its “Wójtostwo” name is very much historical. Up until 1904 it belonged to general H. Dąbrowski. The rooms are in adapted barns and outhouses in direct vicinity of a manor house from the 18th/19th century. The owners assure professional guidance during bird watching trips around the landscape park (April and May) and during trips around the Pyzdry Forest that is distinguished by its “iron homes” and villages set up in 18th and 19th centuries by Olender settlers mainly from Germany. “Wójtostwo” tourist house invites you in the period from April to October.